November 7, 2017 by Sandra 0 comments on "Best Wooden Building Block Sets For Kids"
Wooden building block sets are great for teaching children how to build, stack and create different structures. 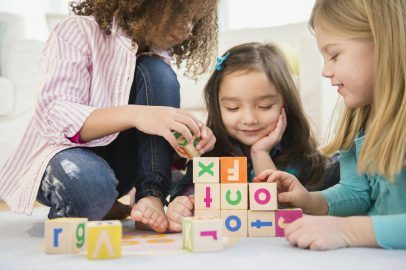 Wooden building block sets encourage imaginative and creative play in children as there are SO many different things that you can build with blocks. These block sets are not only great for building and stacking but also come in handy for teaching children the alphabet, numbers, colors and shapes depending on the style and shape of the blocks. Wooden building block sets are also great on so many different levels in terms of encouraging open-ended play as well as problem solving skills in children. Depending on the age of your child will really determine which set of blocks you think that your child would most enjoy playing with. On this page, you will find a selection of wooden building block sets that are suitable for kids of various ages. The first block set is not only fun for kids to build different sized structures but it also teaches young children about letters, numbers and animals. 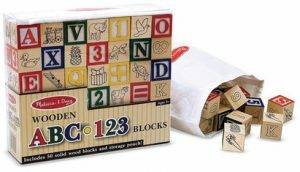 This Wooden ABC – 123 blocks set features 50 solid-wood traditionally styled alphabet blocks with hand-painted artwork on them. The artwork encourages association with the corresponding letter on the block. Featuring solid wood blocks with a colorful collection of pictures, letters and numbers for recognition, matching, stacking and sorting. This set is suitable for ages 2 years and up. There are many things that toddlers can do with these blocks like stacking, sorting and sequencing. This block play-set will provide hours of enriching play for your toddler! Bigjigs Toys Wooden building blocks for small children features a collection of 100 wooden building blocks in assorted colors and shapes. These blocks are the PERFECT size for small hands to grasp and stack on top of each other. They ‘click’ firmly together so children can create all sorts of building projects and then they can easily be detached to start a new design. This product is great for the development of fine motor skills in children and creative play. Kids will also learn different shapes and colors with this building set. The suggested age for this wooden block set is for ages 12-36 Months. Red the fox is a 19 piece wooden block set and 3D puzzle. There are many ways children can play with this wooden block puzzle. 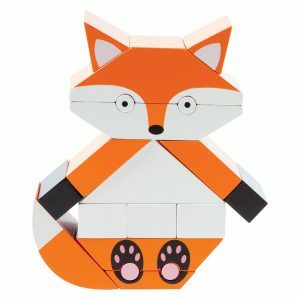 Magnetically match up pieces to create Red the Fox or build and play to your imagination’s content. It encourages both open-ended play and problem solving skills in young children. It’s a stacking toy, block set, construction toy and puzzle all in one. The pieces can be stacked and arranged in hundreds of different ways! This block puzzle is intended for children 3 years and up. This toy will inspire creative thinking in kids as there are so many different ways that children can play with this toy. Ideal as a birthday or Christmas present. Another magnetic wooden stacking block puzzle that you might be interested in getting for your child is called Manhattan Toy Monty The Monster Magnetic Wooden Stacking Block Puzzle. This Monster Magnetic Wooden stacking block puzzle is a 19-piece with magnetically matched up pieces to create this friendly monster or build and play how your child imagines. This toy measures 10.25 inches high. Since 1979, Manhattan Toy has been making award-winning, high quality, educational toys for your baby, toddler or kid. From baby toys and toddler toys to wooden toys and activity centers, our goal is to provide the safest and best toys available. All of our products, from the newest concepts to our time-tested classics, are innovatively designed to inspire imaginative play and delight our customers. The manufacturer’s suggested age for this stacking block puzzle is 3 years and up. Another stacking wooden block set that your toddler will absolutely LOVE is called Melissa & Doug® Stacking Train – Classic Wooden Toddler Toy. This wooden stacking train set features sturdy, pegged cars that are the base for 15 colorful pieces that can be configured over and over again. When assembled, the train is over 17 inches long. Children can also separate the cars to change things up or share the fun. It’s no wonder little ones and their parents choo-choo-choose this toy year after year! This toy encourages fine motor skills and early cognitive abilities in young children and offers endless possibilities to be creative. With this stacking block train, toddlers will also learn colors and shapes so there are many opportunities for learning as well as having FUN all at the same time. Another set of wooden building blocks by Melissa & Doug are called Melissa & Doug® Wooden Building Blocks Set – 100 Blocks in 4 Colors and 9 Shapes. The suggested age for this toy is 2 years and up. This building block set comes with 100-piece set in bright beautiful colors and nine shapes that is the ultimate for creative building and constructing. These traditional wooden blocks are very durable and sturdy in construction. This set offers endless possibilities in terms of building different structures and is great for parents and kids to build things together. These building blocks are also a great teaching tool as it offers children the opportunity to learn shapes and primary colors while having FUN. This wooden building block set is suitable for children 3 years and up. The KidKraft Wooden Block Set comes with 100 solid wood pieces. A variety of colors and unique architectural shapes make it possible to create countless unique structures. And the sturdy construction means that kids will have years of fun building them up, and knocking them down. This toy helps children learn shapes and colors and great for developing fine motor skills in children. This block set offers children endless possibilities in terms of how many different structures they can build with this toy. Another set of blocks that are brightly colored are called Bucket O’ Blocks (Bright). This block set comes with 102 blocks in different shapes, sizes and colors to build with. With these blocks your toddler will be able to build build magnificent, sprawling cities. What I like most about this building block set is the variety of bright and vibrant colors and shapes available that can be used as a teaching tool to help children learn their colors and shapes. These blocks can also be used to sort colors and shapes as well as building different structures like castles, houses or zoos.